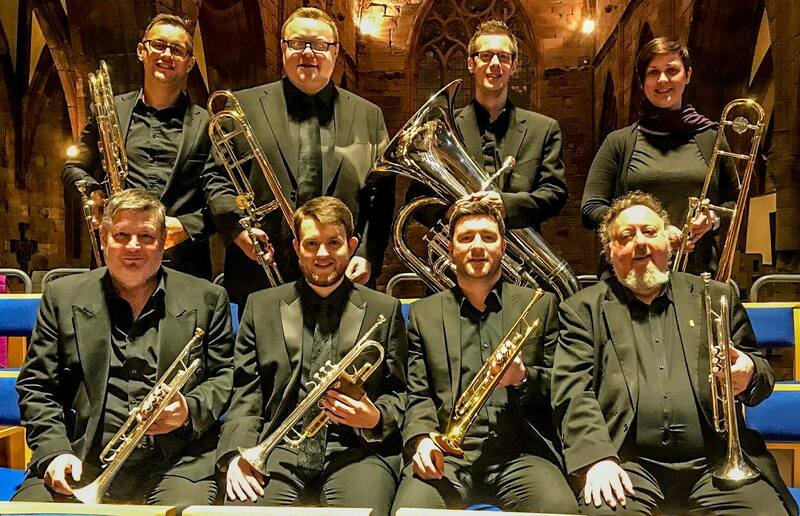 Over the weekend of 17 and 18 March, 2018 Brass Tracks performed two successful concerts as a brass octet. Brass Tracks was invited by the well established East Lothian Choir, The Garleton Singers to perform what was a spectacular programme of both old and modern works for brass octet and choir. These concerts came under the suitable banner of ‘Sound The Trumpet’ – directed by the choir’s conductor, Stephen Doughty. Brass Tracks Octet with the Garleton Singers under the baton of Stephen Doughty. The first concert took place at what is now a familiar concert venue for Brass Tracks, St Cuthbert’s Parish Church, located under the looming Edinburgh Castle. The Sunday concert was in the home town of the choir, in Haddington’s St Mary’s Kirk which is home to Scotland’s longest aisle! Brass Tracks had the opportunity to perform works just for brass octet, including Gabrieli’s Pian e Forte and also a lesser known contemporary work by the Japanese composer, Yagishawa entitled Intrada. These two works are written over 500 years apart the former work is believed to be the first piece written for brass that specifies the instrumentation. Other highlights of the concerts was the two Gloria’s for brass and choir – one composed by John Rutter and the other by Dan Locklair.